Cambria quartz countertops is the premier quartz top available today. Made by American craftsmen, Cambria offers over 140 designs and is always coming out with new collections. Each collection is designed to simulate the look of other natural stone. It has superior durability and is maintenance free. Cambria uses responsibly obtained quartz and is very environmentally conscious. 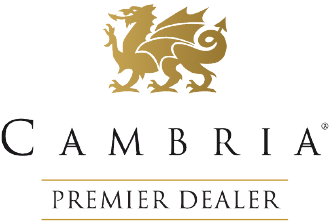 We are a Premier Dealer with Cambria. This means that we get the new colors at our showroom before they are available elsewhere. Ask us about Cambria financing. Contact us to learn how you can improve your kitchen or bath with Cambria quartz tops. For more information on Cambria, click on their logo or any of the resource links below.